Listen to a Bruce Hornsby concert as far back as 2002, and there’s a chance you’ll hear some of what led to this record. 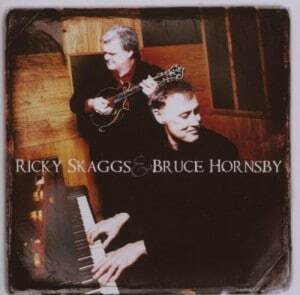 Bruce has talked about it for some time, and it’s finally upon us – the first bluegrass record, with the Ricky Skaggs. Watch that acclaim continue to rise as Ricky and Bruce trade audiences – initial reaction from both camps has been one of astonishment. This was the highest rated album from Bruce since Hot House some twelve years earlier. It was second only to Spirit Trail (1998) to date in terms of shelf life/longevity, and the best since Harbor Lights (1993) for collaborations. Small wonder, with Skaggs and Kentucky Thunder co-releasing the CD. Most popular tracks were remakes of earlier Bruce songs – “Mandolin Rain” and “A Night on the Town”, while another Bruce original (“Dreaded Spoon”) fared very well. The ever-popular Super Freak also rated favourably. The first studio collaboration with Ricky Skaggs and Kentucky Thunder scores very well! George Graham Weekly Album Review: Jazz musicians collaborate all the time, and the result is usually very good, mainly because of the level of musicianship involved. Skaggs and Hornsby have the “chops” as they say, and their long careers of working with other diverse musicians has instilled their sense of musical congeniality. It’s definitely a excellent album that will likely stand as highlight of both their respective careers. Pop Matters: Dedicated fans of these musicians will find things to like on this platter, but casual listeners should instead seek out some of the stellar material in the extensive back catalogues of Skaggs and Hornsby. 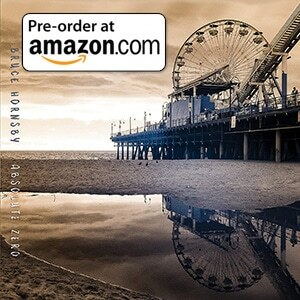 Cory Lindsay: I just got the CD today in the mail from CMT, which I ordered a couple of weeks ago to take advantage of the autographed copy deal. Mandolin Rain is superb. For those who’ve heard Bruce play it at Biltmore lately, it follows those versions. I have no other words to convey it other than it is truly a religious experience! I think this is the definitive Mandolin!! A Night On the Town, Crown of Jewels and Super Freak are all great. I LOVE Super Freak! What a great rendition. Gulf of Mexico Fishing Boat Blues I also immediately liked. You just can’t go wrong here. I think this album definitely needed to be made and I can see why Bruce has been wanting to do a bluegrass record for so long! No doubt this CD will be playing on my Bose for weeks to come. If the grammy rumors are true, I think Hornsby and Skaggs are definitely in need of this honor. What a great combination of musical talent! Brody3665: Just got to listen to it for the first time and I must say that I am impressed. I agree with cory that Mandolin Rain is superb and refreshing. I was kind of hesitant at first when I heard that they were doing an album together but thankfully all my fears were wrong…..
Ellen G: Just got my copy (ordered from CMT) and am listening to it right now. I like it a LOT (although CMT is apparently shipping the autographed liner separately, according to the person at customer service. If anyone has gotten theirs, please let me know). I read the two reviews up at Bruce’s official site (and hate to tell Steven Wine that “Crown of Jewels” is not a new song), and for me, they don’t quite hit the nail on the head. I wish it had been a live rather than studio recording. And I miss the interaction that must have gone on between the two of them–the banter that comes before and after the songs that you get to see on the CMT special. I would think that this must have been hugely fun to do, and I’d like to have more sense of that. That said, it’s still an awful lot of fun and great to listen to. treah: I got the CD today and I love it! My favorite song is Gulf of Mexico Fishing Boat Blues. Just to get a slightly more objective opinion, I played it for my friend Kebe who is from Senegal. He hadn’t heard of Bruce until last year when he accompanied us to the Biltmore show. (What a great introduction to Bruce’s music that was!) He enjoyed the first three songs, but when he heard Mandolin Rain, that was it! And he loves the new version of the song. He had only heard the first 2 measures of the song when he said, “That’s the song Bruce had to stop and tell the guy to shut up, isn’t it?” I said yes it was and sat back marveling at my friend’s memory… I told him as much about Ricky Skaggs as I knew. As we kept talking and listening to the music, Kebe told me the banjo originated in Gambia, a country close to Senegal. I love learning things like that! Anyway, the album gets two votes of “10”-one from Kebe and one from me! erin707: freaking awsomeness man:) i looooove golf of mexico/ fishing boat blues. Victor: Got mine last weekend after ordering through Amazon via this site. I thoroughly enjoyed it from first listen. It seems to be a nice, impartial collaboration — equal parts Ricky and Bruce — though, of course, I prefer the Bruce bits, like Gulf of Mexico Fishing Boat Blues. Ricky’s voice is soooo countryfied, it took some time for me to get used to his style. I also prefer a more modern Bluegrass sound in general… Nickel Creek, say. The instrumental, “Stubb,” was my favorite of Ricky’s material. I enjoyed the Irish influence of some of the sounds. As people have said and the votes have indicated on Si’s poll, Mandolin Rain is the standout here — and I’m glad Crown of Jewels seems to be getting its due. I wasn’t as crazy about Night on the Town in this context as I thought I’d be, however. Obviously, Dreaded Spoon and Super Freak bookend the album with great fun and energy. If anybody wants to send me an mp3 of The End of the Innocence and The Way It Is from Crossroads, that’d be great. I miss them on the album! They were such wonderful renditions — I hope Bruce will bring in a fiddle/violin sound more often in the future!!! PixelPusher: What did I think of the Rick Skaggs and Bruce Hornsby CD? From start to finish, it is an excellent CD. Ricky and Bruce play like they have been doing this for years. Bruce chose one of the best people in bluegrass today to record this CD with him. The bluegrass genre is well represented with some fun lively songs like The Dreaded Spoon, Crown Of Jewels, Gulf Of Mexico and even Superfreak(!). I was also happy to hear some traditional ‘grass like Across The Rocky Mountain, Stubb and Sheep Shell Corn. I know that not everyone will enjoy these, but as a bluegrass fan, I appreciated them. My only complaint about the CD is what was not on it. If you saw the CMT show Crossroads with Ricky and Bruce, you would have seen and heard some awesome renditions of Bruce’s The Way It Is, The Valley Road, The End Of The Innocence and Ricky’s version of Uncle Pen. I know that Bruce’s classics have been covered in detail on other CDs including a bluegrass version of Valley Road that Bruce made with The Nitty Gritty Dirt Band, but I would have loved to have had R&B’s versions on this CD. I hope that this is not the last CD that Ricky and Bruce make. Perhaps they will team up again on one another’s CDs. At the risk of sounding corny, run don’t walk to the store to get this CD! Steve8282: Listened to mine at last and I like it a lot. Bruce compositions stand out for me more but I am enjoying the Scaggs stuff also. Can’t wait for the Jazz. rdiakun: I’ve given this quite a bit of listening since my wife got me a copy for our 22nd Anniversary (she must love me) . I really dug “Gulf Of Mexico Fishing Boat Blues”, found “The Deaded Spoon” and “Super Freak” to be a lot of fun, and am so glad that he chose to make a studio recording of the minor-key version of “Mandolin Rain”. That said, I thought the performance of “Super Freak” on “CMT Crossroads” did a much better job of conveying what a gas it must have been to play and how so many musicians really do rise above it all when they’re playing in front of an audience. I also find myself comparing “Mandolin Rain” to the live version that I have on the CDs from the ’05 Holiday Concert in Williamsburg, with the live one winning out because of little things like JV’s nice fat bass work, and the sort of depth of sound and mood that just really make that verison of that song so flat-out amazing. I guess that’s one of the things that makes Bruce so interesting to listen to… every performance, whether it’s a studio recording or a concert rendition, has something a little different and quite special to offer. It gives us all plenty of room to pick one or more versions that we like best, no matter how hard the process of choosing might be.